The Torcroft has an excellent location, just a few minutes stroll from the seafront and the beach, as well as from the main shopping street, and about 10 minutes walk to the marina. It is a great place from which to explore Torbay and the surrounding area. 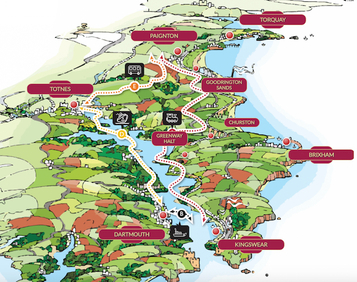 The South West Coastal Path passes through Torquay, making the town a great place to stop over en route. 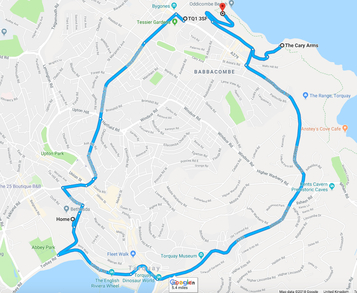 Why not walk to Babbacombe (about 2 ½ hours) and take the bus back?! Drive to Totnes (25 mins) and walk around this delightful bohemian market town, with its 41 independent cafes. Park at Steamer Quay and walk over the bridge into town and up the high street. Drive on to Dartmouth (25 mins) and visit this pretty town, famous for its sea-faring activities and regatta in August. Maybe have lunch and take a boat cruise on the river, or walk to the castle at the entrance to the estuary. Drive back to Torquay, and on the way back, turn off the A3122 to Cornworthy/Tuckenhay (very narrow lanes) and drop in for an early evening drink (and/or meal) at The Maltsters or our favourite country pub, The Waterman's Arms, which has tables right by the river and the old historic stone bridge. 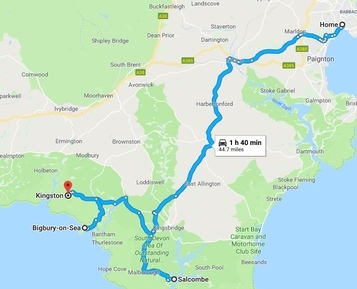 Drive to Salcombe in the South Hams district (1 hour). Parking in the village in summer may be a challenge, so park outside and walk. Enjoy the cafes and small boutiques. Maybe hire a motorboat (no license needed), or take the small boat-ferry across to the sandy beach on the other side of the estuary, or the bigger ferry to South Sands beach. Walk to "Overbeeks" National Trust and enjoy magnificent views. Visit Salcombe Gin and Salcombe Dairy Ice cream! Drive on to Bigbury-on-sea (30 mins), famous for its island and hotel that inspired Agatha Christie. Take the sea-tractor across to the island at high tide, when the island is cut off. Enjoy the beaches and views. Drive on to Kingston (15 mins) and its lovely village pub "Dolphin Inn" for a drink and a meal. 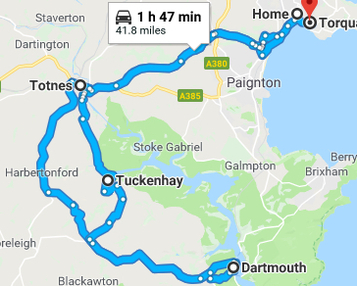 Drive back to Torquay takes around 1 hour. Take the "round-robin" steam-train and river cruise tour. Catch the 10a.m. bus from Torquay harbour (Debenhams) and ride to Paignton, from where you take the steam train to Kingswear, just across from Dartmouth. Take the ferry and have time in Dartmouth. Then onward to Totnes with the Dart River cruise. Return to Torquay by bus. Look for the leaflet in The Torcroft, or go to www.dartmouthrailriver.co.uk. Bear in mind that the tour may go the other way round (i.e. Totnes first). Timings of the cruise depend on the tides on the river Dart. Drive to the pretty village of Shaldon (20 mins) and visit the little zoo, cafes and the lanes. Take the ferry boat across to Teignmouth (leaves from the beach!) and enjoy the promenade and town. Return on the ferry (small fare). Drive on across the bridge via Teignmouth to Dawlish (20 mins) and visit this little town on the sea, with its river running down the centre of town. Walk some of the South West Coastal Path (here is the famous railway line built by Brunel, which was washed away in the storms.). Drive on to Dawlish Warren and take time on the sandy beach. 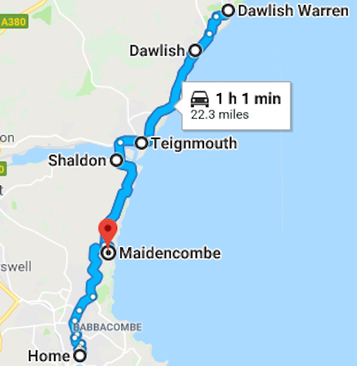 Return to Torquay in around 40 mins, if you wish, dropping in at one of the lovely pubs in either Maidencombe (Thatched Tavern), Combeinteignhead (Wild Goose Inn) or Stokeinteignhead (Church House Inn - one of our favourites for food!). Drive or take the bus to Babbacombe. Walk along the famous Downs and down the very steep road to the Cary Arms, where you can take refreshments. Walk along the path by the sea to Oddicombe beach opposite on the bay, where you also have the choice of dropping in at 3 Degrees West. Take the 1920's cliff railway up to the top of the cliff and return to Torquay either by bus or car. You may also prefer to walk to Babbacombe from The Torcroft along the South West Coastal Path (about 2 hours) and return by bus. It's a stunning walk. Full information about Torbay and the surrounding areas can be found under the English Riviera website; just click the link on the attractions below. A wealth of places to eat and enjoy yourself. Boat trips and ferries leave from here.  An unusual view of the world! Walk down the cliff to the beach and ride back up on the historic railway. From Totnes to Buckfastleigh - a beautiful ride along the river Dart. Watersports in the Bay include: Sailing, canoeing, paddle-boarding, water-skiing and diving. Blackpool sands (opposite) and Slapton sands. North Devon coast and beaches. Eden Project, near St Austell, Cornwall. Dartmouth with its Art Galleries and Fortress. Teignmouth and Shaldon, with its ferry boat. The lovely market town of Totnes. Start Point and its lighthouse. Why not try a Devon Wine Tour? Go to: southdevonwinetours.co.uk for more details or call us at The Torcroft for more information.